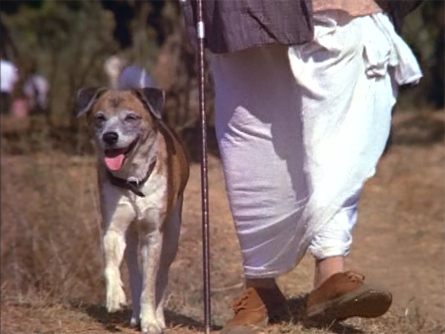 Any film—but especially a Hindi film—in which a dog co-stars is okay with me! Annadata is no exception, and in fact even without the dog it would still be a lovely little fairytale of a movie. Directed by Asit Sen, two great performances by Jaya Bhaduri and Om Prakash embellish a sweet story about love and compassion versus money and greed. The subject is a little hackneyed (poor=love=good and rich=money=bad) but so well done that it doesn’t matter. The story begins with the announcement of a plane crash which has killed millionaire Seth Amba Prasad (Om Prakash). Relatives swarm out of the woodwork for a piece of his wealth, and the greedy parents of Ratna, a girl whom he took in as a child and educated, concoct their own plan. 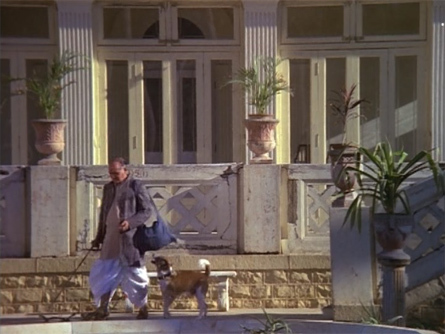 When Amba Prasad calls his lawyer and friend Pestonjee (Krishnakant) to say that he had missed the plane that crashed, Pestonjee is pretty much the only person happy to hear the news. When Amba Prasad returns home and hears the tale woven by Ratna and her parents, he is devastated. He has always treated her as a daughter, and cannot believe that she and her parents would stoop so low just for wealth (to be fair, Ratna is not happy about the deception either, but succumbs to her parents’ coercion). The avarice of his relatives disturbs him too, and in despair he leaves home with his dog Moti as his only companion (dogs, as we all know, care nothing for money, and will love you unconditionally; that’s what makes them so great). 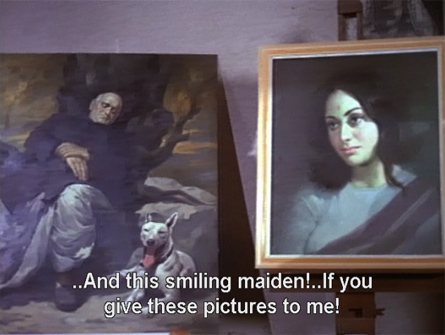 but the painter gives Amba five rupees for posing, despite being a poor man himself. In the village, Amba gets some lunch for Moti and we get a short glimpse of the actor Asit Sen as a daruwallah arguing with a policeman. The heat and exertion get to Amba Prasad, and he passes out. Clever Moti runs to the doctor’s clinic nearby to get help. 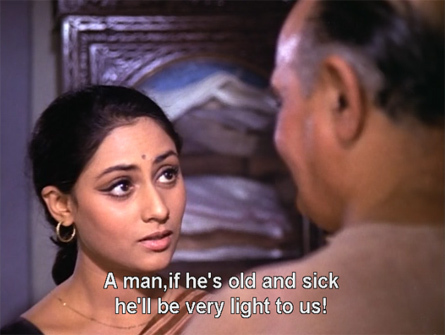 Aarti (Jaya Bhaduri) is the late doctor’s daughter. She and her brother Kundan (Bobby), who has been crippled by polio, live together. She brings the unconscious Amba Prasad home. When he recovers consciousness, he wants to get on his way but Aarti convinces him to stay until he is completely better. As the next few days pass, he discovers what a good, kind person Aarti is, and how hard she works to provide for her little brother and herself. She continues to give out free medicines as her father did, while taking sewing and typing jobs to keep body and soul together. Arun (Anil Dhawan), the painter, arrives to show Aarti his latest painting. When he finds out that she is caring for the old man and his dog, he is upset. He wonders how Aarti can feed two more mouths when she already struggles to feed herself and Kundan. Amba Prasad meanwhile is heartened that he’s found someone so generous and unconcerned about money. He writes to Pestonjee. 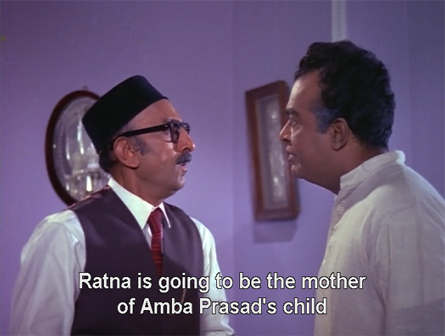 Aarti and Kundan soon feel like they have another father in Amba Prasad. He tries to give Aarti money, although she refuses it; and he helps Kundan with his leg pain. He also quickly realizes that Aarti and Arun love each other. Arun, however, feels that he is too poor and has too few prospects to propose to Aarti, and wants to find a rich groom for her. Aarti herself feels that she has too many responsibilities to impose on a husband (besides Kundan, she owes a local moneylender a great deal of money), and that she will never get married. 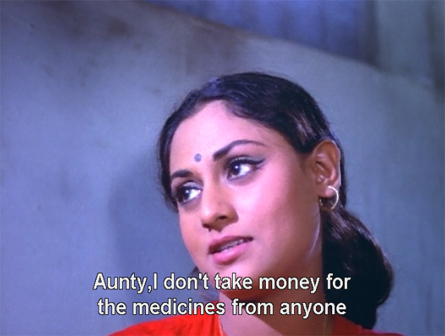 Her brother Kundan, too, wishes he were not a burden on Aarti. 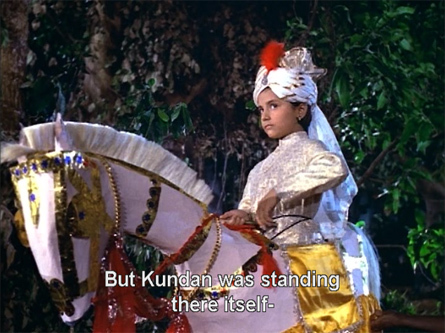 Amba Prasad narrates a story to him one day (it’s picturized as a play) about how Kundan will relieve his sister of all her burdens and get her happily married. So Amba pretends to start work polishing shoes all day so that he can give Aarti food and extra money. She reluctantly accepts it. He also arranges for an art buyer to see Arun’s paintings. 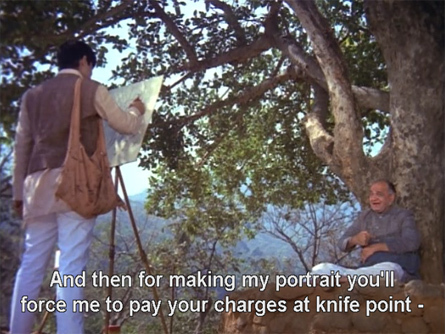 The buyer takes the portrait of Amba (Arun refuses to sell the portrait of Aarti) and gives him Rs 500. Arun uses the money to buy an artificial leg for Kundan, and to pay off the interest on Aarti’s loan from the moneylender. 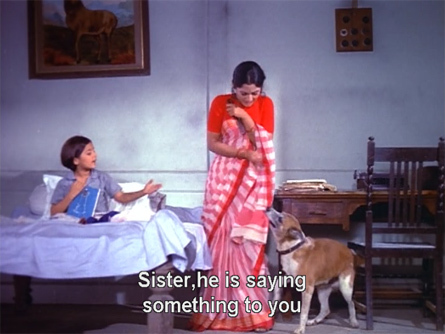 He also goes to see a marriage broker and asks to see pictures of boys. Hilarious! 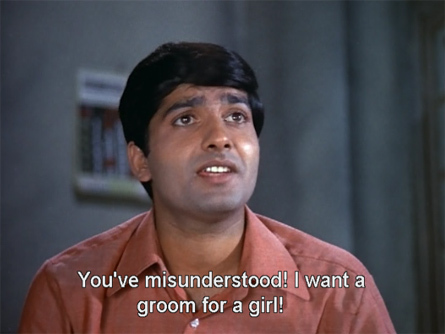 But when Arun tells Aarti that he has found a rich husband for her, she is not amused. In a great scene, he tells her he loves her but is sacrificing that love for her sake because he is poor. and of course also disappointed and heartbroken. She tells him that if he wants to wallow in his poverty, it’s his choice, but he cannot wallow in hers too, and she storms off. Yay Aarti! What will happen to them? Will they find out who Amba Prasad really is? Can he help them, or will they be too proud? This is a really nice film, with wonderful performances and lots of little details that add up to a great watch. 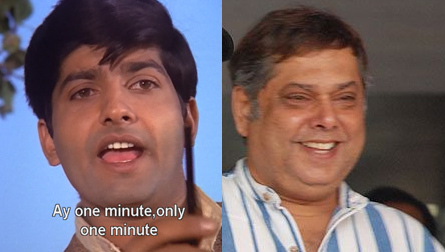 And also, can you believe that our hero Anil Dhawan is director David Dhawan’s older brother (according to imdb.com)? Posted on April 14, 2008 at 12:28 pm in Hindi movies	| RSS feed You can skip to the end and leave a reply. The music was one of the finest from that period. All three songs have achieved a kind of classic status. Beautifully penned by Yogesh. I know, I really need to find the translated lyrics for them all. Sigh. wow, I never knew this movie existed. Now I need to check it out! (great blog, by the way. I regularly follow it, though this is the first time I’m writing). And thanks for your nice words, please do keep coming back—and leave a comment any time! I too never knew that a movie called “Annadata” ever existed. 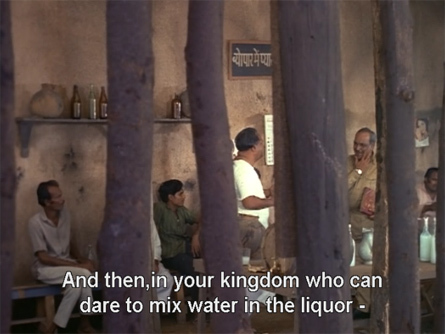 I know this movie only because of Salil Choudhry’s brilliant composition, ‘Guzar Jaaye Din’. It is an intricately complex tune which again has Mozart’s 40th Symphony featuring in the song, the first being Salilda’s, composition from ‘Chhaya’. As the story goes, Kishore Kumar was very reluctant to sing this tune and had to be personally persuaded by Salilda. It is a composition that is full of the unexpected. 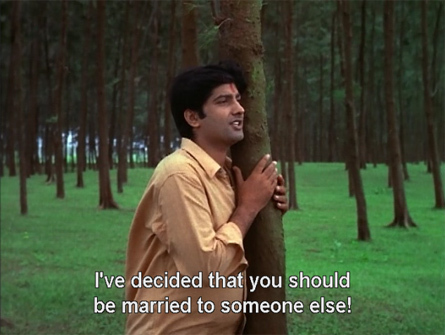 and a man’s persuit of true love.anildhawan and jaya have vertually lived their roles. and what a climax?Iwas in bombay at the time of release of this film and there were no crowds.And a worthless film like haathi meresaathi was running to houseful shows. ours is a hypocritical society.If the same film was shown in english say a richard burton in place of anildhawan,probably,we will be recommending this film to our friends. Ha ha! I love Haathi Mere Saathi too (and my dog really loves it, she gets to bark like a crazy thing at elephants for 2.5 hours). But this is really a special little film with lovely lovely music. Memsaab, didn’t you like Champawati tu aaja…? I thought Anil Dhawan looked too healthy to be a struggling artist. The song Guzar Jaye Din by Kishore Kumar and Champavati Aaja duest by Kishore Asha (from this film) were very famous in Binaca Geetmala . This film is a great film and was a box office hit too. tODAY VERY FEW PEOPLE ARE AWARE OF THIS FILM ONLY coz it contains a hero who is not active in films as a lead hero and is a popular actor in TV serials since late 80’s. Anila dhawan is indeed the elder brother of David Dhawan and he appears in each of the David Dhawan films in 90’s. 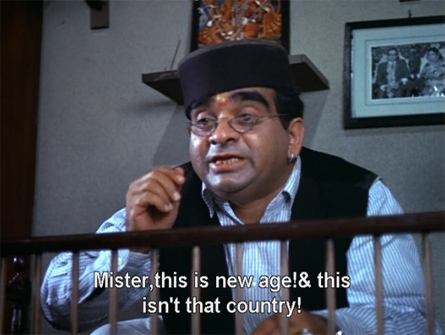 Memsaab have you seen Om Prakash as the leadman in films like Charandas, Dus Lakh, Buddha Mil Gaya etc..
Lookinf forward for your reviews of Charandas, Dus Lakh, Julie, Chupke Chupke , Buddha Mil Gaya , Kanyadaan (1969), Man-Mauji ,Naughty Boy (1962)…. malini….loved your blog…can you please post more articles on jaya ji……..please please please………from those days….her 70s and 80s…thanks a lot…..lovely effort…. thanks for the review. The song,”Raaton ke saaye ghane’ is one of the best ever, it makes me want to see the film but its not available anywhere, I thought until now that it was a shelved project. 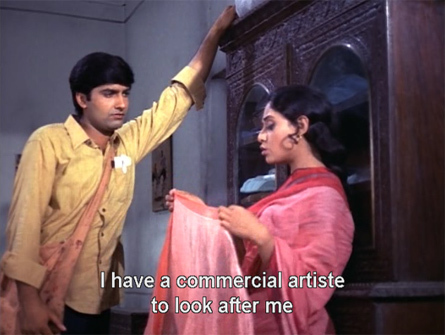 ANNADATA was somewhere around first half of 1972,maybe back to back with PIYA KA GHAR,both canbe described as simpicity at its best,though I PERSONALY saw both these movies years Latter,when I Began to understand cinema,and since then they have remained personaL fav,even now fourty one years after its release,both costarred ANIL DHAWAN uncle/JAYA aunty,both were At PUNE FILM INSTITUTE in same batch,and both these movies can be counted as milestone movies inthere careers,and infact IF I am not wrong JAYA aunty had about eleven movies through out whole year which byitself should be sort of rcord for anyone,as far ANIL uncle goes,that even after giving about thirty movie,and all of them hits between 1970/81,something/somewhere,call it destiny that he could not attain certain height which he deserved,sameway as NAVEEN NISCHOL uncle could not attain certain heights,THIS was so engrossing quite close to relaity,,and add to this all soulfull songs by SALILDA,one can watch this movie and PIYA KA GHAR,and have four hrs of peace,even generation of today,or generation born after 1980,they too will Love these movies,as this cinema does not happen today,all performances by each were excelance at its best,just watch it.RAVINDER MINHAS,JALANDHAR CITY,PANJAB.mihas35@yahoo.com.